Backlit shoji screen separate seating areas. Arched windows allow natural light to illuminate fans. The signature wall was signed by the chef, with wise sayings from Japanese cooking books. A bamboo faucet mounted on back rock and tile wall, is used to service water for guests. Cushions as back rests hang from bamboo poles. 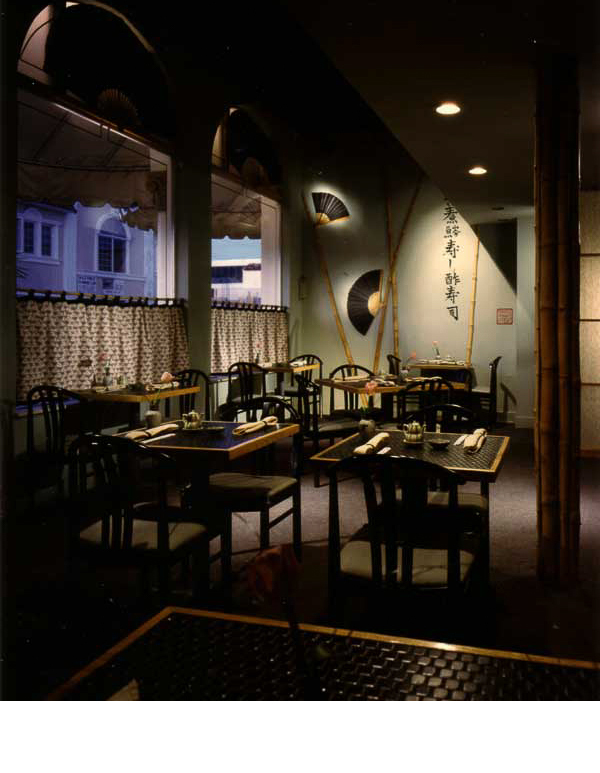 Sasaki was built by two airline pilots who loved Japanese food. Their requirement of a design, was a small budget where they could build and open a restaurant quickly. The two owners built all the serving dishes and the interior spaces of the restaurant. The simple use of shoji screens, paper fans, inexpensive black tile in combination with river rocks and bamboo, allowed for a country Japanese look. Small cafe curtains and off-the-wall upholstery in cushions that hung from bamboo, made the soft goods easy to construct. This restaurant exemplifies the idea that with a simple elegant design, a reasonable cost can be accomplished.